In our last post, we talked about natural bathroom cleaners that can help you keep your bathroom surfaces disinfected without using dangerous chemicals. 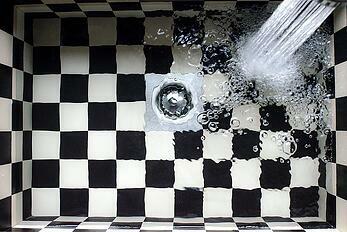 This week we’ll focus on how to unclog a drain without commercial drain cleaners such as Drano or Liquid Plumr. Of course, the best step is prevention. To learn how to avoid problems in the first place, read our post on preventing clogs before they happen. Why should I avoid chemical drain de-cloggers? Using natural cleaners helps you remove unnecessary toxins from your home, plus avoid headache-inducing fumes. In the case of drain cleaners, however, there’s also another factor consider: Regular use of commercial drain cleaning products can actually damage your pipes! These cleaners contain highly potent chemicals, and are often formulated for more extreme clogs. Many people, however, turn to Drano any time the water’s running a bit slowly, and that’s a mistake. When overused, the corrosive chemicals can eat away at the pipes themselves, causing a much costlier problem down the road. Learn more about the risks of chemical drain cleaners. This isn’t always the most pleasant step, but it is often the simplest and most effective. Remove the strainer from the top of the drain. You may or may not need a screwdriver to do this, depending on your model. If you don’t have a strainer or hair catcher, consider spending the few dollars to buy one, since it can prevent a lot of problems in the future! Wipe out the top interior of the pipe with a paper towel. If the clog is close to the top of the pipe, that may be all that’s needed to fish it out. Use a narrow drain tool. Whether you use a three-dollar plastic “hair snare” or want to invest in a more expensive auger or “snake,” the principle is the same. You’ll want to insert a flexible tool deeper into the drain and see if you can fish out whatever’s causing the clog. Be sure to have a trash bag nearby! Use a toilet plunger. If the tub currently has water in it and the drain is completely clogged, the pressure from the plunging action may loosen it. You’ll probably want to go back to step 3, above, to prevent the clog from re-sticking further down the pipe. If you can’t remove the clog using one of the physical methods above, use this tried-and-true natural drain cleaner method. Remove the strainer from the top of the drain. Drop the baking soda down the drain, and then slowly pour the vinegar in after it. This will create a bubbling reaction. Let sit for 30 minutes. Meanwhile, boil the water. At the end of the 30-minute waiting period, carefully pour the boiling water down the drain. The steps above should remove most normal clogs. If, however, your tub drain remains blocked, it may mean there’s something more serious than just a simple hairball at play. A professional plumber has an array of specialty tools to remove especially tricky blockages, and can determine whether there’s a larger problem with your plumbing that needs to be handled. If you live in or near Greenville, SC, give Ken’s Plumbing a call at (864) 242-5511 at any time of the day or night. We’ll help you get your bathroom back in working order again!